The former Commander of a maritime security task group in the Gulf has invited Djibouti to join the Combined Maritime Forces (CMF) during a recent visit to the country. 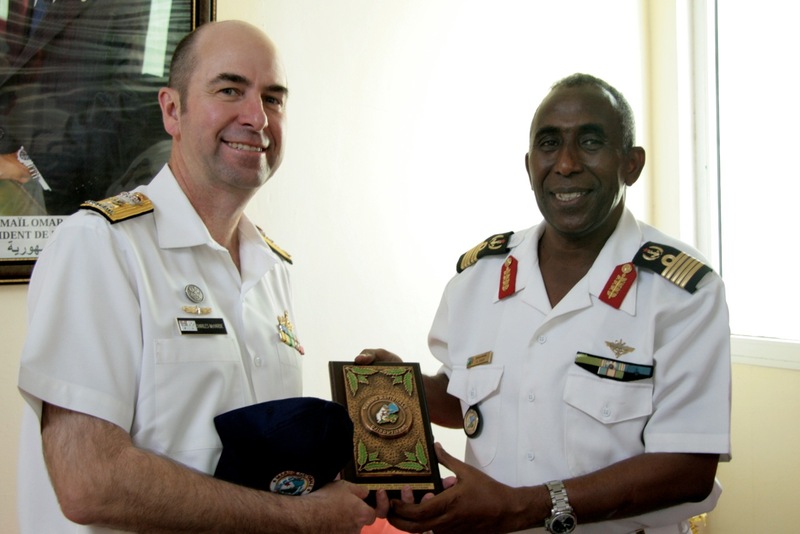 As one of his final tasks in command of Bahrain-based Combined Task Force (CTF), Commodore Charles McHardie, RAN, had a focus on growing Djibouti’s support to Combined Maritime Forces (CMF) and wider regional maritime security issues. While in Djibouti Commodore McHardie called upon the Chief of the Djiboutian Navy, Colonel Abdourahman Aden Cher and the Deputy Commander of the Djiboutian Coast Guard Lieutenant Ibrahim Kibar at their respective headquarters. “This visit provided me with an opportunity to extend my thanks to Djibouti for the important support that they provide to maritime security operations in this region,” Commodore McHardie said. “I was heartened by the progress their forces have made in just a few years and look forward to following their progress in the future. “CMF shares as strong relationship with Djibouti, the exchange of information and enhanced regional knowledge that flows from this is very important to our maritime security operations. Additionally, Djibouti’s port provides extensive support to the logistics sustainment of CMF forces which is a vital for the ongoing conduct of our operations. The CTF Commander also met with the staff of Combined Joint Task Force Horn of Africa (CJTF HOA) at Camp Lemonier. “While the CJTF HOA forces are firmly focused on the situation in Somalia we have a common focus on counter-terrorism,” Commodore McHardie said. “The impact of their operations on land will have flow on effects for the CTF 150 maritime space. CTF150 is one of three task forces operated by CMF involving 27 nations in the naval partnership. Commodore McHardie has since handed over command of CTF 150 to Captain Jean-Michel Martinet of the French Marine Nationale.